There are a lot of people looking for jobs, and there are a lot of people looking to scam the job seekers. Two things are working for the job scammers. First, the number of people looking for jobs online is unprecedented. Never before have this many people been unemployed at the same time there so many web-based job search resources. Second, many of the people looking for jobs have not been unemployed during the era of the job board and are not savvy about the dos and don’ts of the online job search. When I was job hunting, I found Craigslist to the be the most useless and scammer filled place to try and find a job. The legitimate job posters are so bombarded with resumes yours has little chance of being seen and at the same time the scammers are quite sophisticated. The goals of job scammers are diverse. Some may simply be hiding a come-on for some product or service, others may try to get your personal information for marketing or even criminal activities. 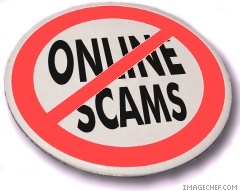 Many disguise “work at home” scams as legitimate employment opportunities. Here are a few lessons I learned, mostly thanks to my experience with Craigslist. I always suspect ads that make you follow a link to a website. There are plenty of legitimate ads that want you to apply at a website, but you should proceed with caution. Be careful when submittting personal information. I wouldn’t divulge my birthdate or my social security number to anyone online. Don’t pay for anything. There are scams asking applicants to pay for credit checks in order to be considered for a position. Don’t fall for it. Grammatical errors, poor spelling and the like generally point to scammers, many of which are scamming outside the country. If the offer seems too good to be true, it is. Happy job hunting and stay safe out there.